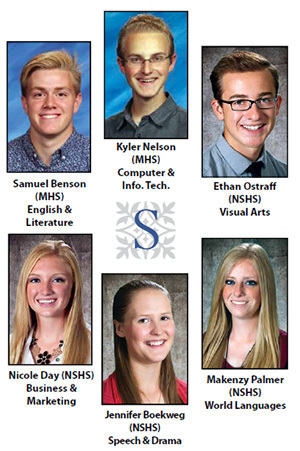 The six Sanpete students to earn the title Sterling Scholar. World-class accomplishments to be sure, but from among Sanpete’s very own: the four are among six Sanpete high school students who came out winners in the 2016-2017 Sterling Scholars of Central Utah awards ceremony on Tuesday, March 21, at Richfield High School. Ten others were named as runners up in several of the competition’s 15 categories. Students from 13 schools participated in the competition, which includes features rigorous judging in areas of scholarship, leadership and community service. Their achievements in those areas are highlighted in online portfolios the students create (some spending a year or more in the process) to be judged by experts in particular categories. Those judges also interview competition finalists on a specified day, and pronounce winners for the awards ceremony held that same evening. Henrie’s school boasted four winners and runners-up: Samuel Benson was named a Sterling Scholar in English and Literature, while Kyler Nelson took the award in Computer and Information Technology. Lillian Bean was a runner-up in Visual Arts, and Sydney Howell was a runner-up in Speech and Drama. North Sanpete High School students were winners in four categories: Ethan Ostraff was the winner in Visual Arts; Nicole Day won in Business and Marketing Education; Jennifer Boekweg took Speech and Drama honors; and Makenzy Palmer won the World Languages category. Six other NSHS students were runners-up: Dustin Angerhofer, Mathematics; Avery Briggs, English; Melanie Beck, Dance; Mayra Patino, Family and Consumer Science; Abraham Bunting, Music; and Lydia Madsen, General Scholarship. 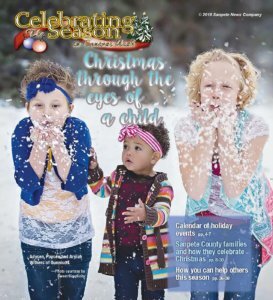 Two Gunnison Valley High School students were runners up in the competition. Sharlene Otten was a runner-up in Agriculture Science, and Henry Johnson was a runner-up in Computer and Information Technology. At the ceremony, winners were introduced with short summary of their noteworthy accomplishments. Each of the winners had unique experiences that helped them stand out from the crowd. Samuel Benson’s (Manti, English and Literature) first syndicated article was published at the age of 12. His work has appeared in a number of publications, including the Deseret News, the Harvard Crimson, and US Lacrosse Magazine and his articles have reached over one million readers online and in print. Kyler Nelson (Manti, Computer and Information Technology) built his first computer at age 14. He has placed ninth in Networking Concepts and 10th in Network Design at FBLA national competitions. Ethan Ostraff (North Sanpete, Visual Arts) has shown in more than 10 art shows that have been exhibited locally and worldwide. He placed in the top 25 in the State Senate Scholarship Visual Arts Competition and received an honorable mention award in the 2016 all-state high school art show. Nicole Day (North Sanpete, Business and Marketing Education) placed fifth in Microsoft Office at FBLA national competitions as a freshman. She was the Microsoft Office Word 2013 State Champion and is master certified in Microsoft Office 2010. Jennifer Boekweg (North Sanpete, Speech and Drama) received a “Best Theatre Student of the Year” award at the 2017 Utah Theatre Association Conference and has portrayed eight lead roles during her high school career. Makenzy Palmer (North Sanpete, World Languages) spent three weeks in Peru where she helped build a school to benefit an extremely poor community. She has written for the school newspaper for three years and served as its managing editor for the last two years. All six winners plan to go on to college and have received scholarship offers from numerous schools, along with cash prizes, Sterling Scholar key chains and certificates.